An old favourite, yes thats right the temperature is up (a little), its time to bring out my all time favourite sandals! Followers of my blog may remember these from last summer, they pretty much featured in almost every outfit post i made. God knows what the price per wear is, at only £29.99, i wish i had bought these in the tan colour too. I seem to be building up a collection of amazing new pieces in my wardrobe but i’m just not ready to wear them yet, it feels like it would be a waste. Certain articles of clothing are made for summertime, i mean real full blown summertime…holidays abroad and hot and sticky nights. Yes you can style then with knitwear and neutrals to make them weather appropriate but that just wouldnt be doing them justice. Whilst holding my ‘hero pieces’ hostage, i’ve been looking to the menswear collections to inspire me. 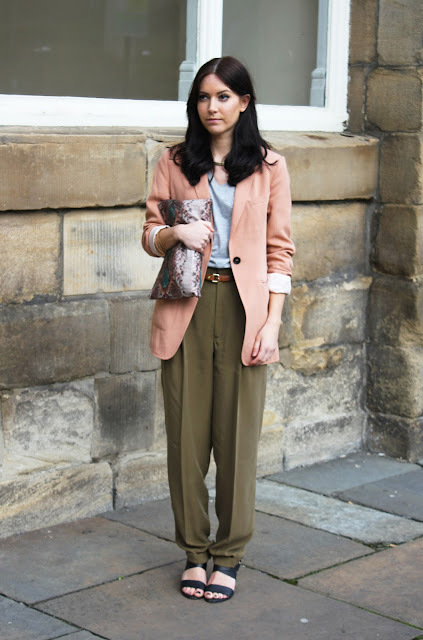 Tailoring, safari influenced colour palettes and wardrobe staples are the perfect antidotes. I’m no stranger to mixing it up, working in mens fashion means i have to keep an eye on the competitors so i often shop from mens stores aswell as ladies. If you dont already, maybe start to have a sneaky peek too, you will be suprised how many unisex pieces there are! It might be something as simple as the fit of the t-shirts suiting your body shape better. You never know, that dream ethnic printed shirt you were after could be right there waiting for you. Love love love the pink and the olive colors together!